Both Oxford and Classic pillowcases are available from Connie Home Collection in linen, Egyptian cotton and standard cotton. Oxford pillowcases match the different designs. Classic pillowcases have no design and are available in plain white, Egyptian cotton and Linen. The styling of your pillowcases can radically change the visual impact of your bedroom and in particular your bed linen. The pure white colour of the Connie Home linen pillowcases, both classic and Oxford, gives your bedroom a fresh clean look. Our Classic Atlanta linen pillowcases are easy to wash and relatively easy to iron as the natural, rumpled, look makes for low maintenance. This type of high quality linen pillowcase is ideal for use all year round, regardless of the season. Being made from 100% natural washed linen, the pillowcase has anti-allergic properties which make it suitable for all skin types. The linen pillowcases are available in two styles, the Atlanta Oxford linen pillowcase which has a 5cm border around each edge and the Classic traditional type of pillowcase. Both types of linen pillowcases have traditional envelope style closures at one end for comfort and convenient insertion of the pillow. 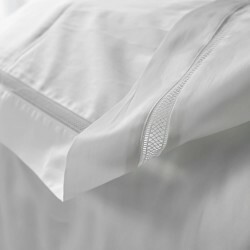 Our elegant Egyptian cotton pillowcases are supplied as sets of two. The Classic pillowcases are available in the size 50cm x 75cm and the Oxford pillowcases in the same size, but with an additional 5cm decorative edging. The extra border around the Oxford pillowcases is the perfect touch of luxury to finish off the styling of your bedroom. 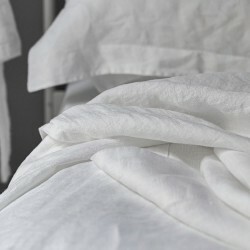 The pillowcases are made from an internationally renowned, high quality 100% Egyptian cotton. The natural fibres of the Egyptian cotton pillowcases are both soft and durable, the perfect combination for your ideal night’s sleep for many years to come. Across the Connie Home range of luxury bedding you will discover designs for all tastes. The Classic Egyptian cotton pillowcases are always plain white and with decorative borders. The Oxford Egyptian cotton pillowcases are designed to match the particular range, so for example the Oxford pillowcase from the Harmony range has an attractive navy blue border. The range of pillowcases from Connie Home are made from 100% natural cotton, a pure and hypoallergenic material free of man made fibres. A great favourite of the textile industry, particularly in the more prestigious sector, natural cotton is always in demand especially because of cottons ability to adapt perfectly to many different skin types. With our natural cotton collection, the Heathcote Oxford pillowcases are notable and stand out with an elegant design of stripes running through the fabric. These cotton pillowcases are supplied in sets of two and measure 50cm x 75cm with a 5cm decorative Oxford style border around each side. These cotton Oxford pillowcases will make your sleep even more relaxing and the softness of the fabric is maintained over time, despite frequent washing. Something which means you can enjoy the freshness of the pillow and they will still look marvelous for many years.